"[09-21-2017] The Food and Drug Administration (FDA) is warning that the liver disease medicine Ocaliva (obeticholic acid) is being incorrectly dosed in some patients with moderate to severe decreases in liver function, resulting in an increased risk of serious liver injury and death. These patients are receiving excessive dosing, particularly a higher frequency of dosing than is recommended in the drug label for them. Ocaliva may also be associated with liver injury in some patients with mild disease who are receiving the correct dose. The recommended dosing and monitoring for patients on Ocaliva are described in the current drug label. We are working with the drug manufacturer, Intercept Pharmaceuticals, to address these safety concerns. Health care professionals should determine the patient’s baseline liver function prior to starting Ocaliva. Patients with moderate to severe liver impairment (Child-Pugh B and C) should be started on the approved dosing schedule of 5 mg once weekly, rather than the 5 mg daily dosing used for other PBC patients, and if needed, can be increased up to a maximum approved dose of 10 mg twice weekly. Health care professionals should monitor patients frequently for disease progression, and reduce the dosing frequency to once- or twice-weekly for patients who progress to moderate or severe liver impairment. In all patients treated with Ocaliva, monitor frequently for liver injury (e.g., worsened liver blood tests and adverse liver-related reactions that may be inconsistent with the patient’s extent of disease). If liver injury is suspected, discontinue Ocaliva. After the patient has stabilized, weigh the benefits against the risks when deciding whether to re-initiate treatment. Educate patients on the symptoms of potential liver injury. In the 13 months after Ocaliva was approved in May 2016, FDA received reports of serious liver injury or death associated with Ocaliva. * The FDA's Adverse Event Reporting System (FAERS) includes only reports submitted to FDA, so there may be additional cases about which we are unaware. 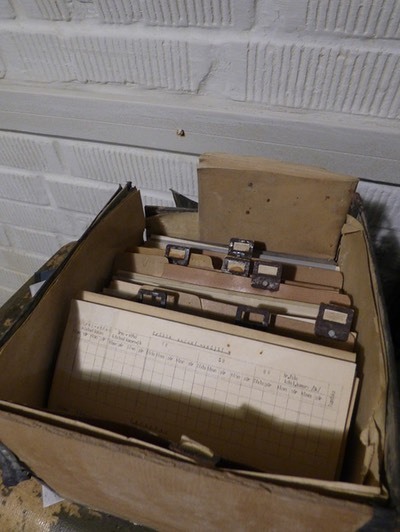 Nineteen cases of death were identified, of which eight provided information about the patient’s cause of death. The cause of death was reported to be worsening of PBC disease in seven cases, with cardiovascular disease cited in the other case. Seven of these eight cases described patients with moderate to severe decreased liver function who received Ocaliva 5 mg daily, instead of a dose no greater than 10 mg twice weekly as recommended in the label prescribing information for patients with this extent of decreased liver function. FDA also identified 11 cases of serious liver injury with Ocaliva use. Six of the patients who had moderate or severe decreases in liver function at baseline and developed serious liver injury were receiving Ocaliva 5 mg daily, instead of a dose no greater than 10 mg twice weekly as recommended by FDA in the drug label. Three of these six patients died, which were included in the 19 death cases mentioned previously. Ocaliva was discontinued in four of six cases, which resulted in one patient experiencing symptom resolution and an improvement in a liver blood test. The remaining three cases did not report the response after discontinuation. The other five cases of serious liver injury were reported in patients with no or mild decreases in liver function prior to initiating Ocaliva. Four of these five patients received Ocaliva 5 mg daily, and one did not report the dose. Ocaliva was discontinued in all five cases, which resulted in one patient experiencing symptom resolution and one patient experiencing improved liver blood tests and symptom resolution. The remaining three cases did not report the response after discontinuation. We urge health care professionals and patients to report side effects involving Ocaliva and other medicines to the FDA MedWatch program, using the information in the “Contact FDA” box at the bottom of the page." ICPT company claims that no causal link has been established with a higher-than-recommended dose. So, where is the truth when ICPT writes in the letter « Liver injury, liver decompensation, liver failure, and death have been reported in patients with moderate to severe hepatic impairment when OCALIVA was dosed more frequently than recommended in labeling for such patients." As usual it is difficult to get a clear message from Intercept. What is true is that they are enough embarrassed that they had to alert physicians around the world of the risks of OCALIVA, before the Regulations Agencies would do so! 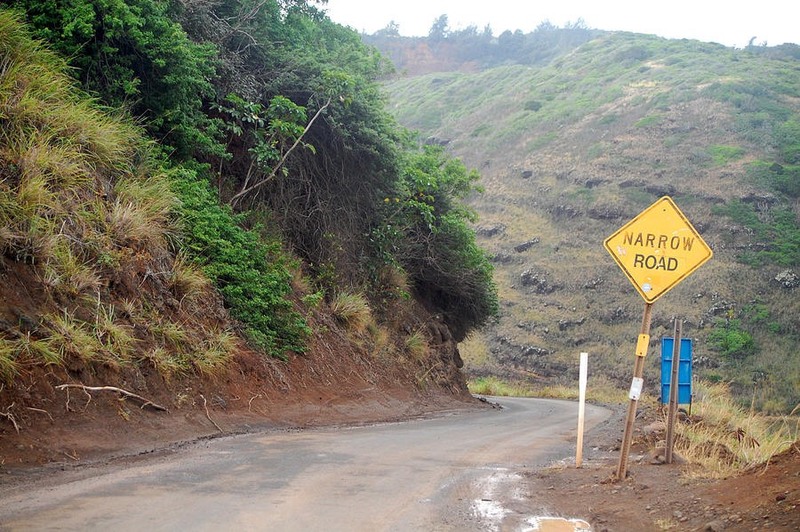 It is a responsible stance ! 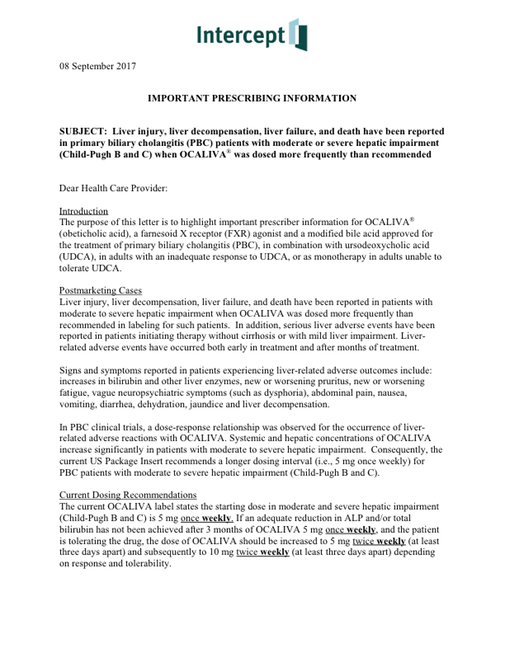 The risk of liver failure or injury on OCALIVA patients with severe hepatic impairment was already knowns, they were noticed and estimated by the FDA in the Gastrointestinal Drug Advisory Committee (GIDAC) Meeting report April 7th, 2016 in their chapter 9 and in the conclusions. Trial 747-201 was a dose-ranging trial that explored the efficacy and safety of OCA as monotherapy. Three months in duration, it evaluated two OCA daily doses (10 mg and 50 mg) against placebo in a randomized, double-blind, parallel group trial which enrolled 59 adult PBC patients. Trial 747-202 evaluated three daily doses of OCA (10 mg, 25 mg, and 50 mg) in a randomized, double-blind, placebo-controlled clinical trial conducted in 165 adult patients with PBC evaluated as an add-on to a standard ursodeoxycholic acid regimen (13­ 15 mg/kg/day). The phase 3 clinical program consisted of a one-year, randomized, placebo-controlled, clinical trial (747-301), which was followed by an open-label, long-term extension. In addition to a placebo arm, trial 747-301 included two different OCA dosing regimens: a fixed-dose, 10 mg arm and a titration arm in which OCA treatment was initiated at a lower dose (5 mg) that was up titrated to 10 mg at month 6, depending on patient’s tolerance to treatment and biochemical response, the latter being prespecified as a reduction in ALP and total bilirubin. The patients enrolled in this trial were adults with PBC who had been receiving UDCA for at least 12 months, with the UDCA dose stable for ≥ 3 months. This study was criticized by FDA because of the related recruitment, different from the initial design and which included, in majority, patients with a relatively mild disease. As the majority of patients already had normal bilirubin levels at baseline, the FDA was obliged to modify 'post hoc' their analysis criteria, removing bilirubin levels reduction and keeping only ALP reduction as criteria. It is not common to see a drug getting an agreement on trial criteria modified post hoc by the FDA itself ! Nevertheless, the committee gave the agreement but identified a risk of liver failure and recommended, after a plasma concentration simulation, to limit the dose for patients with severe hepatic impairment, at 5mg/ week at start. It was a very cautious position because some patients were dosed 70 times more during phase 2, and 14 times more in phase 3. The recommended starting dosage of OCA is 5 mg orally once daily in adult patients who have failed to achieve an adequate reduction in alkaline phosphatase on a stable dose of UDCA for an adequate duration or who were intolerant to UDCA. Rationale: See Section 3.4.1 for details of evidence to support the starting dose, and Section 3.6 for details of monotherapy for subjects intolerant to UDCA. If an adequate reduction in alkaline phosphatase has not been achieved after 3 months of OCA 5 mg once daily, and the patient is tolerating the drug, increase the dose of OCA to 10 mg once daily. Interruption of dosing for up to 2 weeks followed by restarting at a reduced dose or on an alternative dosing schedule. For patients who continue to experience persistent or severe pruritus, consider discontinuing treatment with OCA. No dose adjustment to the starting dose is needed in patients with mild hepatic impairment. However, we recommend that the starting dose of OCA for moderate and severe hepatic impairment (Child-Pugh B and C) should be 5 mg once weekly, rather than once daily. If an adequate reduction in alkaline phosphatase has not been achieved after 3 months of OCA 5 mg once weekly, and the patient is tolerating the drug, the OCA dose should be increased to 5 mg twice weekly and then subsequently to 10 mg twice weekly depending on response and tolerability. It is unusual to get an agreement for a drug based on a trial criteria modified post hoc by the FDA itself ! So the dose can vary from 1 to 14 depending of the patients hepatic impairment level ! One can imagine that it is not so easy to establish the right dose and that errors and higher-than-recommended doses prescription might occur. The last news show us how cautious the FDAs 'advisors were with their doses recommendations and that they were right ! The physicians should respect the recommended doses for new drugs still in phase 3 and with no feedback. "4.4. What are the limitations of PBPK model for OCA and CDCA? So it will be difficult for doctors to evaluate the hepatic impairment before prescription and death can occur if they were wrong .. not easy to prescribe such a drug ! In the Intercept’ letter, one phrase can alert ! It mean that patients with no severe hepatic impairment also got serious adverse events! Despite the fact that they were not overdosed, following the cautious recommendations of FDA, they still got in trouble. Intercept management says it has no influence on the future of OCA in NASH, but let's be serious, who can believe that? The maximum dose allowed in PBC treatment is 10mg/day. In their first report, the FDA clearly explained that a bigger dose could be statistically dangerous for the liver and the letter sent by Intercept to the physicians confirm that ! But the doses tested in phase 3 (REGENERATE) are 10mg/day, and 25 mg/day with no specific dose for patients with hepatic impairment. Does it mean that NASH patients do not have any hepatic impairment, even with advanced fibrosis?, even with cirrhosis? PBC patients and NASH patients can surely have different metabolic reactions to OCA but are they documented? There should be significant implications for the ongoing study, some centers around the world recruiting patients for the OCA Phase 3 will maybe make a pause, just the time to understand, it would be a responsible decision. Some may not remember but the previous OCA Trial (FLINT) was already halted by the DSMB (independent board for study safety assessment) for safety reasons ! DSMB will monitor more closely all the adverse events in REGENERATE now! Today we discover that adverse effects, liver disease or serious liver failure, can occur too on patients with mild hepatic impairment under OCA and that some deaths may be linked to the drug (not yet confirmed). 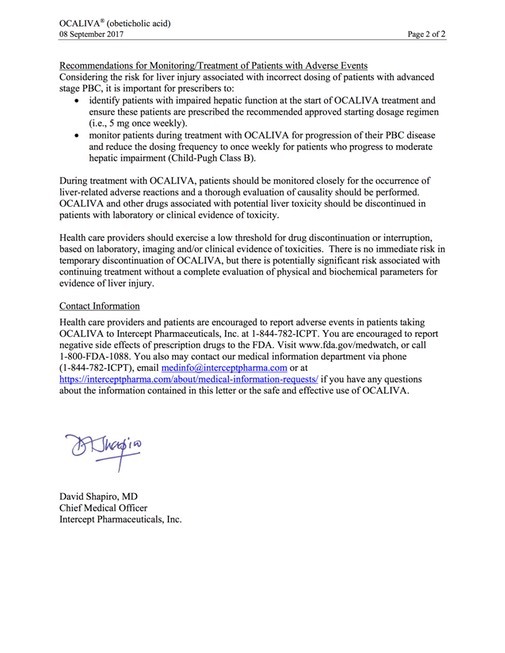 Safety proof is the main thing to be looked at for new drugs, and OCALIVA seems weak on that point. That's make its pathway to NASH treatment thinner by the day. Thanks to Julian for his English reviewing contribution !